In this light painting tutorial I am going to show you how you can take long exposure photographs of water drops on a psychedelic colorful reflective CD surface with a Mini Maglite flashlight. I'm using a water dropper, a M2A016 Mini Maglite Flashlight, a regular CD, a Nikon D300s DSLR, a Manfrotto 055XPROB Tripod, and some color gels. I also used an ND8 Filter so I could use an aperture of F11. The gels and ND8 filter are optional. 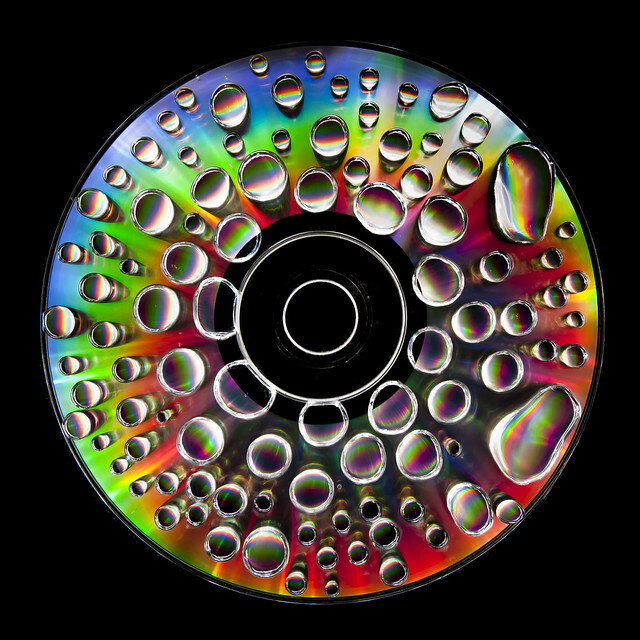 Take the water dropper and place a bunch of droplets on the CD after you have put it on a table of your choice. The table I was using was a laundry basket with a thin black blanket over the top. Fancy! In order to get my aperture to f11, I was using a simple ND8 filter in front of my lens. This isn't necessary, I just wanted my photos really sharp, and f11 is the sharpest spot on my lens. You can go down to f22 or smaller and skip using the filter if you want. Just use the highest f number you can and the lowest ISO number possible. This will limit the amount of light being exposed to the camera sensor, which is what you want in this situation. Maglites are bright! Try making different patterns around the CD with the Maglite flashlight. A really cool one to do is to place the light level with the CD next to the table. 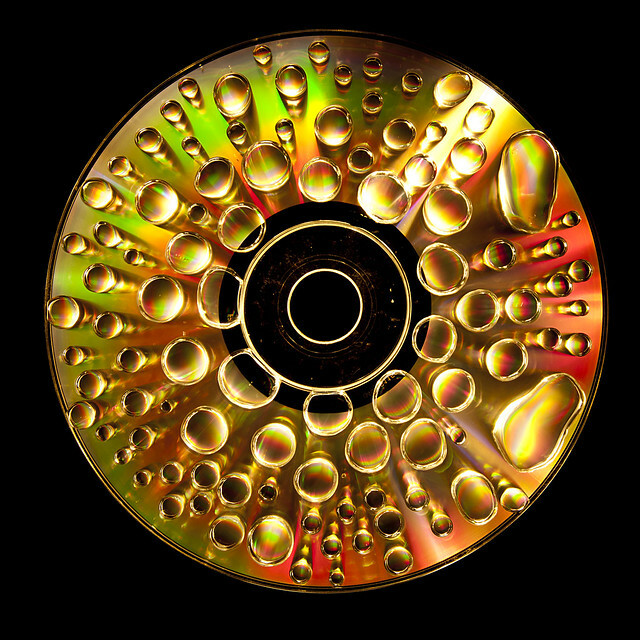 This creates a perfect circular reflection in the circular water drops on the circular CD! Really cool. Try pointing the light diagonally down on the CD, and just try different directions and distances away from the CD. You are bound to get a cool shot. In order to help me be sure that I get the psychedelic rainbow colors on the reflective CD surface, I Temporarily widened the aperture on my lens to f3.5 and then went into Live-View Mode. This makes it easy to see exactly what the camera sees, so you know what direction to aim the light to get colorful rainbow effect. After you see the rainbow effect appear on the CD in your viewfinder or in Live-View mode, get out of live view mode, go back to smaller aperture you were using before, and then take yo' picture. love this! i wish i had a tripod like yours, but an advantage of not having one like that is that i have a little more reflection area for my light painting. Excellent demonstration and you have really woken me up to the potential to play around with light to create a work of art. I would love to see one of these images as a large print, nicely framed – I’m sure it work very well on an office wall. I hve a friend who makes CD copies for clients – I’ll make one of these images for him for his publicity material. Keep them coming and thanks again. Like allways, great work man. Really like all the varied results! Thanks for the detailed process and sharing how much fun and how creative you can get with water and a CD! Thanks for sharing! 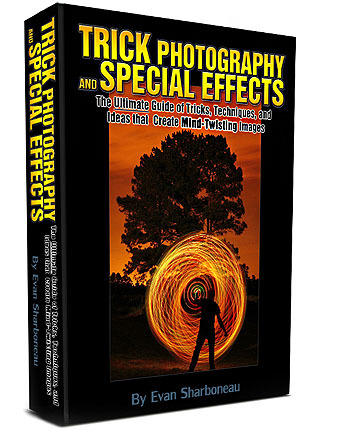 Thanks so much Evan for sharing all the very cool photo tricks that you do! I am a fan for sure! Thank you so much for sharing all those wonderful tips and tricks. I really love this but you said you used colour gels but I can see where you used them and i’m not sure I know that they are? a) why arent my pictures as sharp as yours? b) when i upload them, they dont look as perfect as i think they come out in the camera. Hi where do you buy the gels used in the Phsycdelic CD making? Hey, great tutorial! It inspired me to create this picture – http://rtvincent.tumblr.com/image/41940810720. Love your stuff and hope to see more videos soon as I have watched all your current videos! This video was very helpful! Thanks! One question I have is…where did you get the tripod? What is it called exactly cause I can’t seem to find one to buy. Again, thank you. Your videos have helped me have some great fun making some new amazing photos! Great video. Your videos are inspiring and i have learned a lot from this video and it is next on my list to try. You are very talented, thanks for taking the time to put it together. Really cool. Just tried it and very pleased with the results. Did a little light painting with my MagLight as well! And thanks for the ebook too. Really inspiring.